Day 1: Fly to Boston. On arrival collect your car and proceed to your hotel. Day 2 Boston: Day at leisure to explore. Why not walk the Freedom Trail, visit Quincy Market or perhaps visit the Tea Party Ships and Museum? Day 3 Boston/Kennebunkport: Head out of the city and north towards Salem, the site of the infamous witch trials. Continue along the coast to the charming harbour towns of Gloucester, Rockport and Portsmouth before crossing into Maine and to the popular resort of Kennebunkport (90 miles). Day 4 Kennebunkport/Bar Harbor: Enjoy a leisurely drive along the beautiful Maine coast to Bar Harbor. Along the way, you'll find numerous small towns and quaint villages where you can stop and enjoy the scenery (210 miles). Day 5 Bar Harbor: A full day to explore Arcadia National Park, one of the oldest and most beautiful national parks in America. Discover soaring peaks, dramatic glacier-carved valleys, clear lakes and the rugged shoreline. Witness the area's natural wonders from Park Loop Road or drive to the summit of Cadillac Mountain, at 1,530 feet, the highest point on the US Atlantic seaboard. 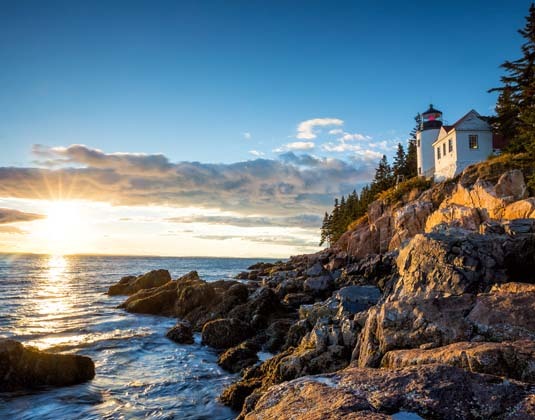 Day 6 Bar Harbor/White Mountains: During your drive today you'll see spectacular mountain ranges, pristine forests, historic villages and enchanting covered bridges as you travel inland towards the White Mountains, the "rooftop of New England" (230 miles). Day 7 White Mountains/Stowe: Today traverse the White Mountains that divide the New England states of New Hampshire and Vermont. The route takes you through some of New England's most beautiful scenery (120 miles). Day 8 Stowe/Williamstown: Continue south along Route 100 where you will take in some of the most spectacular scenery in Vermont's Green Mountains. With their dense forests, the mountains are home to bears, moose, wild turkey and deer. See picture-perfect villages and some of Vermont's famous covered bridges before crossing into Massachusetts' Berkshires, known for their rural beauty and cultural assets. Your overnight destination is the college town of Williamstown (160 miles). Day 9 Williamstown/Newport: Drive south and pass through a series of wonderful little towns, including Lenox, summer home for the Boston Symphony Orchestra. See Hancock Shaker Village near Pittsfield before continuing to the storied little city of Newport, Rhode Island, once a prosperous colonial seaport (180 miles). Day 10 Newport/Cape Cod: America's most prominent families - from the Astors to the Vanderbilts - have summered in Newport. Some of their spectacular vacation homes are open for viewing, so be sure to allow time to see these before continuing along the coast to Cape Cod (100 miles). Day 11 Cape Cod: A full day to explore magnificent Cape Cod with its high cliffs, rolling dunes, broad beaches, miles of walking trails, picturesque villages and delicious seafood. Perhaps make time to visit Plymouth, a living panorama of Pilgrim and Colonial times and see the Mayflower II. Day 12 Cape Cod/Boston: Bid farewell to Cape Cod and drive to Boston (80 miles). Return your car at the airport where your tour concludes. Departures: Daily between Apr-Oct 18. Tour price: The price shown is based on the best value travel dates in low season and includes international flights to and from Boston, compact 4 door car with fully inclusive insurance and 11 nights accommodation.